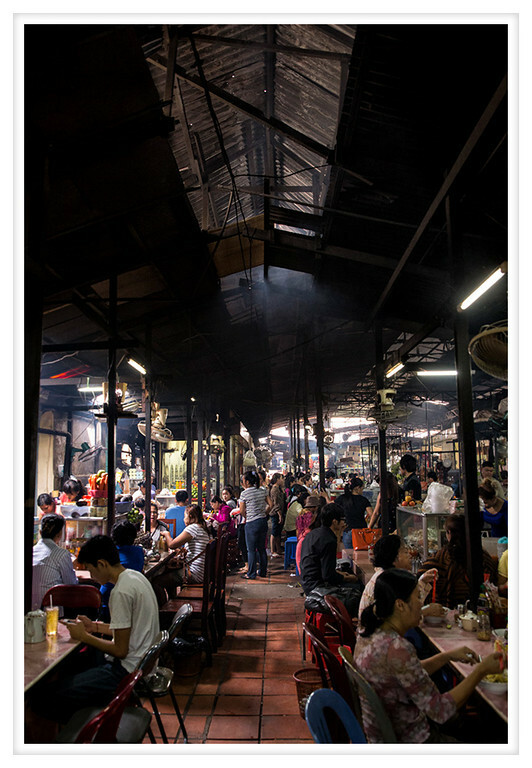 Phnom Penh's Russian Market, despite being popular with foreign visitors, is geared towards local residents. In addition to the normal tourist kitsch there are people selling food, clothes, shoes, bedding, paint, hardware, tools, auto parts, tailors, hair dressers, and more. You could buy almost everything you could possibly need at the Russian Market and for the locals there is an entire section that serves Khmer food. Many people have breakfast at the markets before the do their daily shopping and, regardless of the time of day, there are rarely any empty seats. The smell of onions, garlic, fish, chicken, rice, and noodles permeates the air and conversations are punctuated by the hiss of food hitting a hot pan. There is a slight smokiness to the air as food is cooked. The air is humid and warmer thanks to all the fires lit in this section of the market. For those of us unaccustomed to the heat it is almost stifling but my fascination overcame my discomfort and I had to see what people were eating. Honestly, almost all of it looked delicious!